Welcome at Erasmus+ Project NAOS! The central topic of NAOS is professional capacity of teachers concerning dealing with diversity related to migration (in all its different forms). Professional capacity includes innovative forms of cooperation between educational professionals and other professionals dealing with children. The project runs form 2014 until 2017. This website is intended to be used for dissemination. All our activities and publications are found here. All publications are free to be downloaded. The objective of this Erasmus+ strategic partnership is to strengthen professional capacity in the partner countries (Netherlands, Belgium, Croatia, Cyprus, Estonia, Greece, Norway, Lithuania and Portugal) and their respective schools, with the ultimate goal to increase educational attainment and reduce drop out and unemployment among groups of migrant children. The project is called ‘NAOS’, a star that refers to the fundament of a Greek building. By choosing this name, we emphasize the idea that professional capacity is the fundament of good quality education. 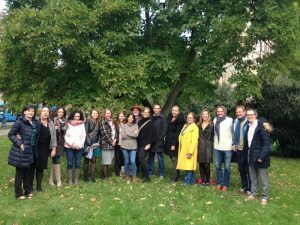 Our Erasmus+ project NAOS, a project where we looked and analyzed how European teachers in primary and secondary education prepare for diversity, has now come to an end. The end conference was held at the Erasmus University Rotterdam on Wednesday, the 21st of June 2017. Interactive workshops were given by each partner country, and good practices across diverging educational systems could be “visited” throughout the span of one day. You may access the final wrap-up presentation of the conference under the end-conference tab on this website. We would like to humbly thank everyone who attended the conference, making it a great and worthwhile day. Special thanks to all the NAOS partners for all their work during the project, and of course their excellent organization of the study visits. The 20 schools that were visited in these 3 years all serve to exemplify that positive change is being made on an every-day basis. We can say with honesty that each and every one of these schools has something to contribute to the conversation of enhancing teacher development in the approach and instruction of diverse groups of students. Tangible improvement is being made, and we are proud to have been part of documenting this!